Philippines Food!! Why don't you try Philippines foods?! It is so nice taste!! Bicol Express is a Philippine food made with pork and coconut cream that will have you expressing how much you adore the taste! Bicol Express is the name given to a popular dish which originated in the Bicol Region of the Philippines. It is a stew made from long chilies (siling labuyo), coconut milk, shrimp paste or stockfish, onion, pork, and garlic. 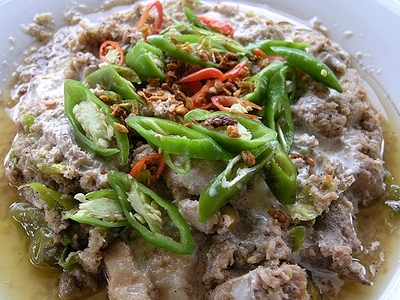 Bicol express is a favorite food of the Filipinos. It is so hot at spicy but it has been a Philippine delicacy and known worldwide. If yo like hot and spicy foods, try Philippine foods from Bicol. Copyright (C) 2007 Philippines Food!! Try Good Taste Philippine Food All Rights Reserved.